It finally happened! Stephanie and I signed up for a 5K every month from September to December, and this is the first one that we both attended and was a full 5K! Also, it was the most awesome of all the 5Ks (though perhaps not quite as awesome as the .5k, because come on). This particular walk benefited the Children’s Research Institute, which helps children with neurological and physical special needs. In fact, one of the best things about this event was that in addition to having a 1K and 5K, they had adaptive versions of both races so that people with various needs could more easily participate. 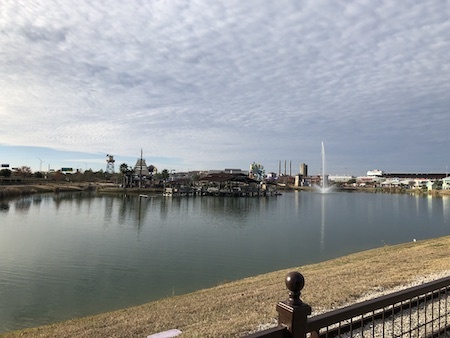 The event took place right next to Morgan’s Wonderland, an amusement park that is built to accommodate children with many kinds of needs, from swings that can hold wheelchairs to quiet sensory processing buildings. Despite Wonderland being very close to where I live, I’ve never been, and part of our route walked us through the park (which was closed, so we didn’t interrupt any park-goers!). It was such an amazing place! I will let the link above do most of the talking, but generally I loved everything about the park. I got this shot of it from afar while we walked around the park lake into an area away from where the noise and crowds would be on an open day. All the artwork and design and empowerment everywhere was awesome. The event hosts were awesome too. Complete contrast to our last 5K that was pretty much packed away and gone before any of the walkers finished. We had people cheering for us until the very last person crossed the finish line. 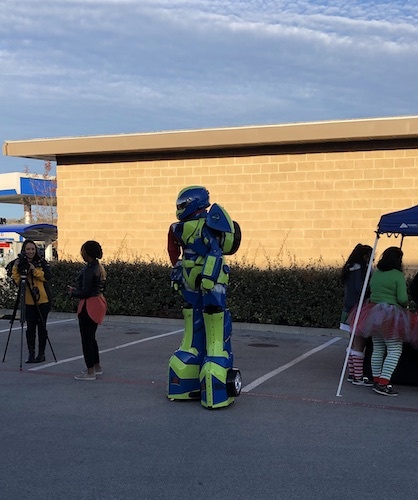 There was a man dressed as a transformer out there for the kids, and H-E-Buddy came as well. There were two Santas, both male and female (and no, she wasn’t Mrs Claus). The sponsors had donuts and breakfast tacos and coffee and fruit for all the participants, and had a zumba dance party going on as well. There were about 250 participants altogether, so it was still a very small group, but it was a large enough group that it was easy to get pumped up and enjoy the festivities. The perfect amount of crowd for these kinds of things – not so small that there’s no one to really run it, and not so large that you get sensory overload! Stephanie and I completed our 5K much faster than normal, about a 17:30-min/mi pace. We were walking so fast initially to get some distance between us and a woman with bells on her shoes (many people were dressed as elves, as this WAS an Elf 5K!) and then we just kept on going. It’s definitely the fastest 5K I’ve done in awhile – 54:07 – it was even a couple seconds faster than the one I walked/ran back in September (Brave Pajama 5K). (To be fair my GPS said that that one was 3.2 miles though, so maybe I was just a teensy bit faster when I walked/ran – let’s just go with that and save my ego a bit, ha!) After we finished, we hung around the festivities for a bit and then went to Dunkin for iced coffee. Altogether, it was an awesome 5K and a great cause and one we both think would be a good one for the future. 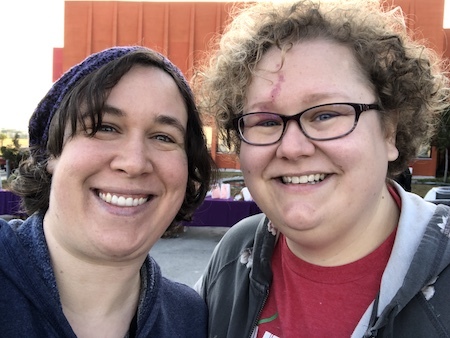 We won’t be continuing monthly 5Ks in the new year – personally, I just can’t afford it while we’re trying to recover from our financial nightmare – but we’re going to try to do a few that are important to us throughout the year. This will probably be one of them. This entry was posted in Wellness and tagged fitness. Bookmark the permalink. That sounds like an amazing experience. I love that more and more people are becoming aware of all types of special needs, not just the observable ones. And that park? I would love to send my cousin down there. He has severe CP. Even though he is almost 30, he has never traveled outside of Wisconsin because it is so difficult for his parents and for him. To have him experience an amusement park that caters to his needs would be a dream come true. That would be so lovely! And the park gives free admission to those with special needs. They’re non-profit, and I read an article where the owner/creator said they expect about a million in losses every year that they have to make up by fundraising, but they’ve done so well in keeping up in the eight years that Wonderland has been open.